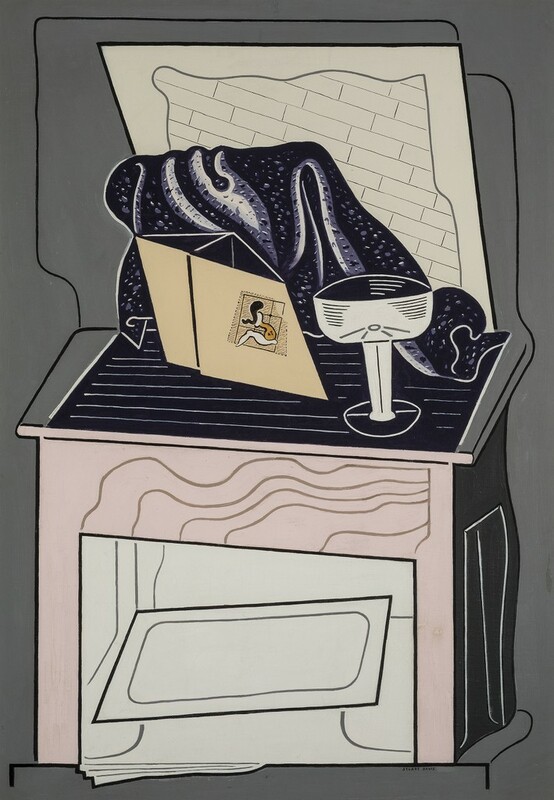 A leading American modernist and strong advocate of cubism, Stuart Davis produced flattened still-life paintings and city views that blend abstraction with popular commercial imagery. With its distorted planes, Super Table challenges conventional notions of space and directly alludes to synthetic cubism. Laid out on a pink wooden table, a glass, draped fabric, and notebook are reduced to geometric, linear motifs stacked from the simplest to the most elaborate. The work’s invisible brushwork and cartoon-inspired style recall the mechanical perfection of commercial posters and prints. Its monumental size may suggest the intrusiveness and anonymity of billboards. Uniquely American in its hard-edge style and evocative of popular graphic imagery and design, Super Table also alludes to the French movement known as purism, whose adherents painted still lifes in an ordered, classical manner.